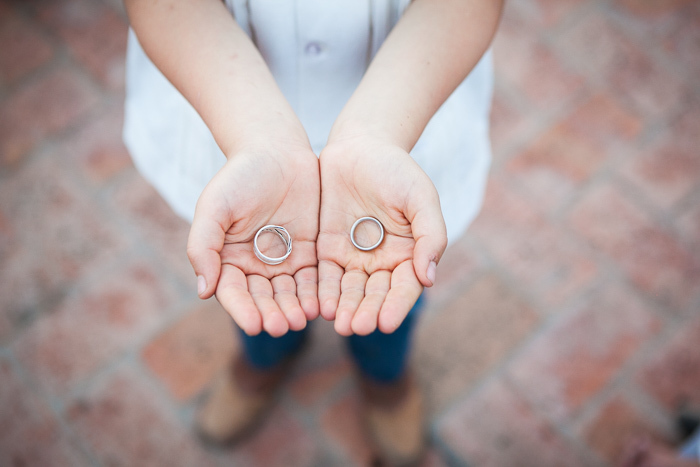 Our most successful joint venture, our son, holding our wedding rings. Somehow, Wiley and I have been married for twenty-five years. There was a time in my life when I thought only old people had been married that long. Long enough to struggle through those years of the banal giving of wood, paper, and clocks, to the promised land of silver. Silver is heavy, and it’s worth something. It holds its value, and it’s durable. It gets tarnished, but it polishes right back up again with a soft cloth and some effort. Building a life with another person sounds romantic and poetic at the outset, but it’s damn hard work. Not to say that we’ve fought excessively during the last quarter century, although we have and certainly we’ve left tooth marks on each other that have faded over time. But being committed to another human being means that you go through life together. While that may seem like the most obvious of declarations, sharing your life with someone means that what they go through, you go through. Better or worse. No matter how badly you might want to shout, “Not my circus, not my monkeys,” as the saying goes, and run far away, you stick around, you dig in your heels, and you deal with whatever comes your way. “Your”, in its plural form. Both of you, together. Stopping for a beso in the streets of San Miguel, under the watchful gaze of the mojigangas. Wiley and I have gone through our share of upheaval and change, and through it all only thing I have known for certain is that he would continue to love me, no matter who or what I became. Well, short of becoming a serial killer, I suppose, although I wager that despite overwhelming DNA evidence and skeletal remains being exhumed from the backyard, Wiley would be still fighting for another appeal on my behalf. In addition, there has been significant and undeniable chemistry between us since the moment we met that persists to this day. Lots of people have denied the importance of that aspect of a relationship, but they don’t really know what the hell they’re talking about, to put it bluntly. Or they’re lying to themselves. Perhaps the most important reason we’re still together also sounds the most trite, but here it is: we have fun together. We love adventure and adrenaline. We love going places and doing things that most people wouldn’t consider. We love standing in the front row at concerts and singing along while raising our fists in the air. We love throwing big parties with lots of people and staying up late. Filemon doesn’t think too much of marriage, apparently. So it should come as no surprise that we decided to commemorate our twenty-fifth trip around the sun together with a Mexican wedding extravaganza. 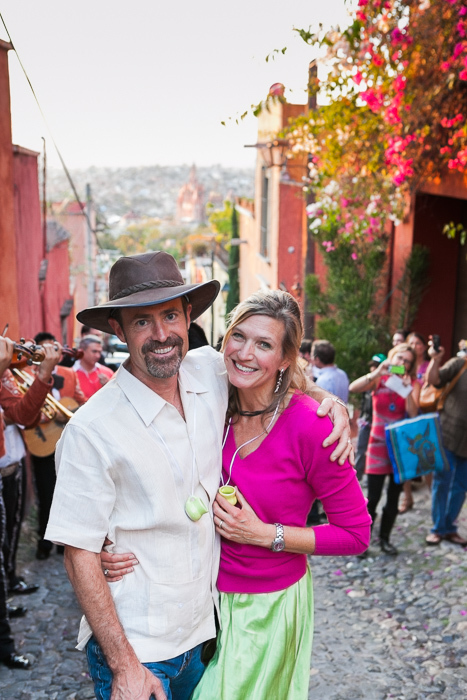 We had a personal celebration on the actual day, which was August 26th, here in San Miguel. We spent the entire day together, exploring parts of the town we had never seen, and eating and drinking our way right though the center of it. A friend suggested a New Year’s Eve party, and to both of us that seemed the perfect idea. 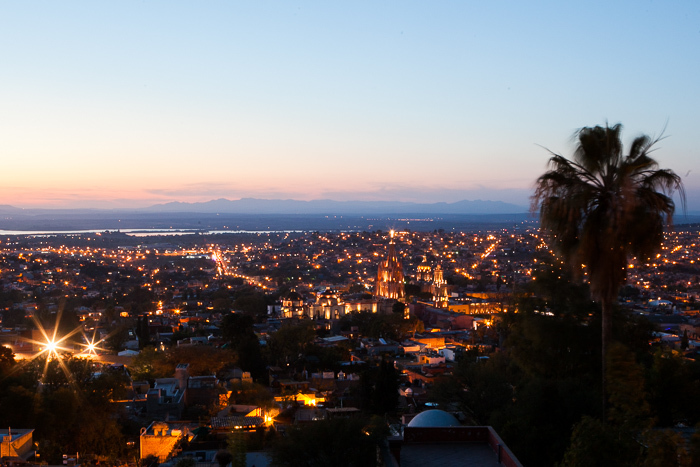 In fact, when we initially looked at the house we are living in, we stood on the roof and envisioned what a big party up there could be like, with a live band and fireworks exploding over the town square and the magnificent, Cinderella’s castle-like church known as the Parroquia. Turns out we got exactly what we wanted. The Parroquia and Filemon, ready for the party. We invited a number of friends from back home, and were pleased when we started getting emails back with flight arrangements. 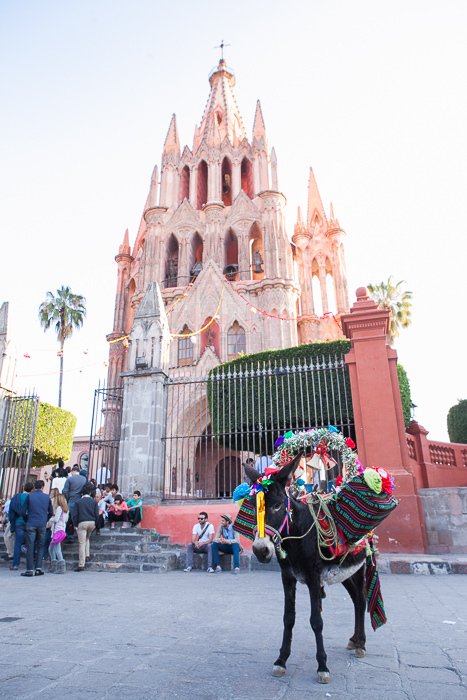 San Miguel is not the easiest place to get to, nor the cheapest, so it was extremely gratifying to know that friends from home would want to make the trek to celebrate with us. Also in attendance were many of our new friends from San Miguel – ex-pats and Mexicans alike – which cemented a lot of our fledgling friendships. Mexican weddings are legendary for their extravagance as well as their length. Not that we wanted to pretend that we were in our twenties again and have an honest-to-goodness wedding, but we did want to co-opt some of the more festive aspects of a boda into our celebration. Party-planning reached Olympic levels of difficulty as several of the vendors I dealt with had no English, and I had only my marginal Spanglish with which to arrange details. In addition, given the cash-based economy of this area, I had to max out my ATM withdrawal capacity over several days leading up to the event and walk around with envelopes full of pesos cryptically labeled “MARIACHIS”, “ARMANDO” and “MOJIGANGAS”. I planned things in something of a flash-mob fashion, having everyone meet in front of the Parroquia at 5PM on New Year’s Eve. My stomach clenched in a sickening way as we stood there at ten until five and I entertained what-if-you-threw-a-big-fat-Mexican-wedding-and-no-one-came thoughts. 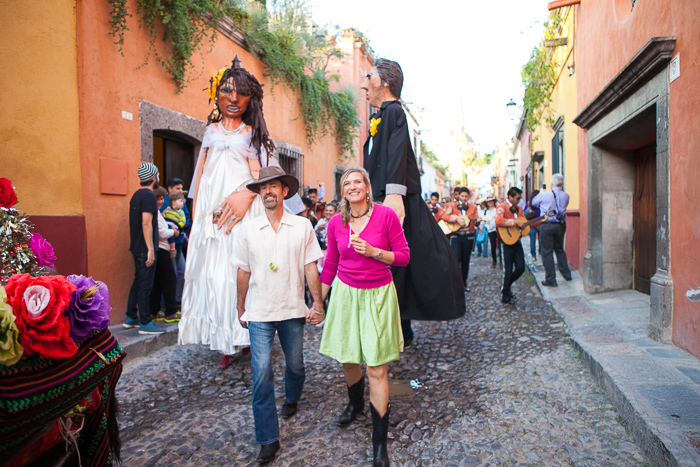 I let out the breath I had been unconsciously holding as I started seeing familiar faces in the crowds of people on the square, along with mariachis, our friend Armando and his wedding burro Filemon (more on this later), and the traditional ten foot tall mojigangas, or wedding puppets. Let’s get this party started, y’all. Arriving at home, high over San Miguel, gang in tow. 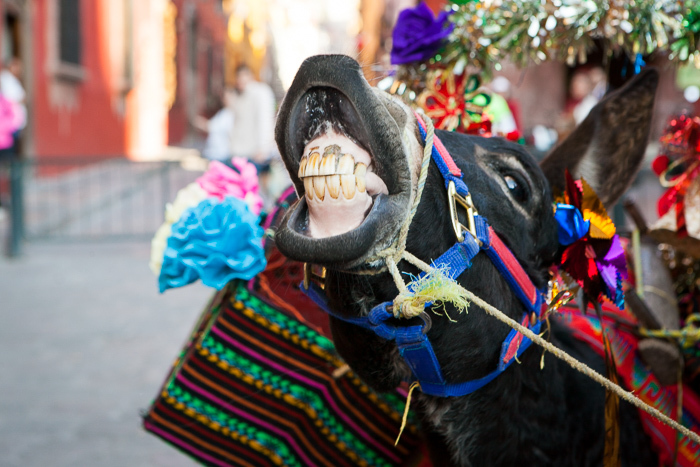 It’s traditional in San Miguel for the wedding couple to parade through the streets following a burro festooned with flowers. 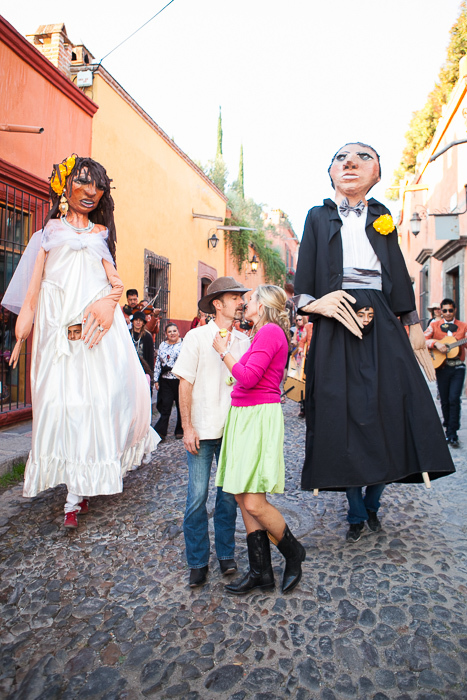 They are accompanied by hoards of well-wishers and a mariachi band, along with the wedding puppets. Small ceramic cups with ribbons through the handles are passed out among the crowd and are filled with tequila, as it’s considered auspicious for the couple to receive toasts from the hordes of followers. Our party swelled in numbers as we passed through the streets of town on our way to our house for the party. Over sixty cups were passed out and we went through the better part of two large bottles of tequila in about 45 minutes. There’s no telling how many people were filming us and taking photos of the parade as we made our way home. Once at our house we adjourned to the roof-top for cocktails. The bartender hadn’t shown up yet, but luckily our friend Lacy, who came all the way from New Zealand for the festivities, knows her way around a bar took charge of the situation. Then our friends Ann and Sam, who have been married even longer than we have, led us through our wedding vows for the third time. View from the roof, shortly after sunset, New Year’s Eve 2014. It could not have been a more perfect evening, with the sun setting behind the mountains as we finished, and dusk casting a soft orange glow over everything. After dinner we danced until the wee hours and then chowed down on pozole, the traditional Mexican soup of pork and hominy, before falling into bed near 3 AM.